Materials - bronze, Cedar, marble and stainless steel, height 5m. We also worked with Haida Carver Jonathon Yeltatzie on this project. Scroll down to read further details about the commission. Click slide show with music by Lola Perrin. Designed by Hotson Bakker Boniface Haden Architects the Rotary Centre for the Arts is a multi-purpose venue providing a wide array of activities including theatre, visual art, music and festivals. Our commission is sited to take full advantage of the designated space at the south end of the new atrium. Each Obelisk represents an art form; literature, visual arts and performing arts. Two of the Obelisks also support cast bronze elements, Thinking Head and Acrobat - they represent the central concept of creative thought leading to the creative act. Two marble podia have three pairs of footprints carved into the upper surface which make reference to the three sculptures made in Kelowna by Zhao Lei, Marion Lea Jamieson and Dawn MacNutt during the symposium. Phil carved the sides of the obelisks at a waterfront site and was assisted by Haida Carver, Jonathon Yeltatzie who designed his own imagery. We also based themes on the Okanagan Valley. Designed by Hotson Bakker Boniface Haden Architects the Rotary Centre for the Arts is a multi-purpose venue providing a wide array of activities including theatre, visual art, music and festivals. Our commission is sited to take full advantage of the designated space at the south end of the new atrium. Each Obelisk represents an art form; literature, visual arts and performing arts. Two of the Obelisks also support cast bronze elements, Thinking Head and Acrobat - they represent the central concept of creative thought leading to the creative act. Two marble podia have three pairs of footprints carved into the upper surface which make reference to the three sculptures made in Kelowna by Zhao Lei, Marion Lea Jamieson and Dawn MacNutt during the symposium. 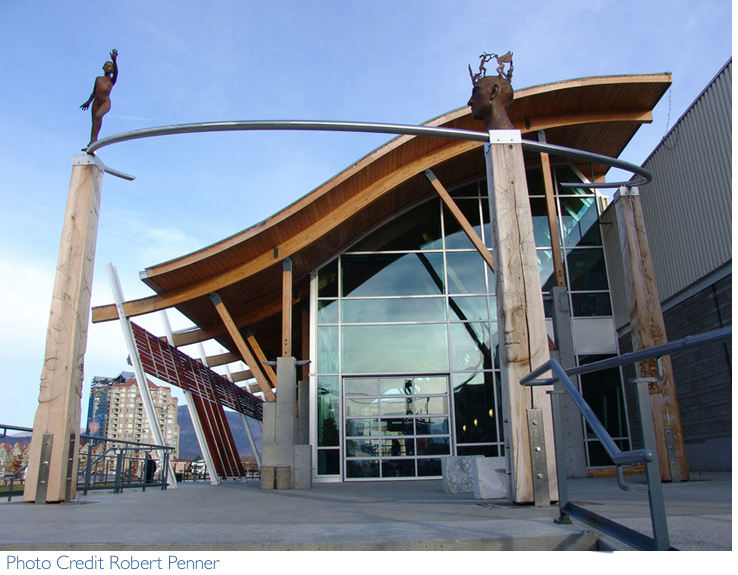 Phil carved the sides of the obelisks at a waterfront site and was assisted by Haida Carver, Jonathon Yeltatzie who designed his own imagery. We also based themes on the Okanagan Valley.